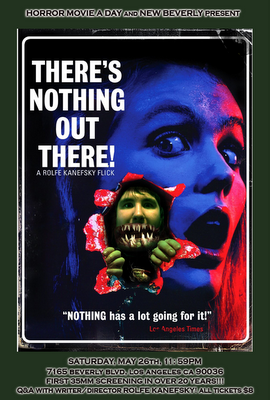 Horror Movie A Day: HMAD Screening: There's Nothing Out There! While I love all of the screenings I've done so far at the New Beverly, they all have one thing in common: they were major studio releases when they originally came out. Not that there's anything wrong with that, but I'd love to do more films that you might not have been able to see at your local multiplex back in the day. 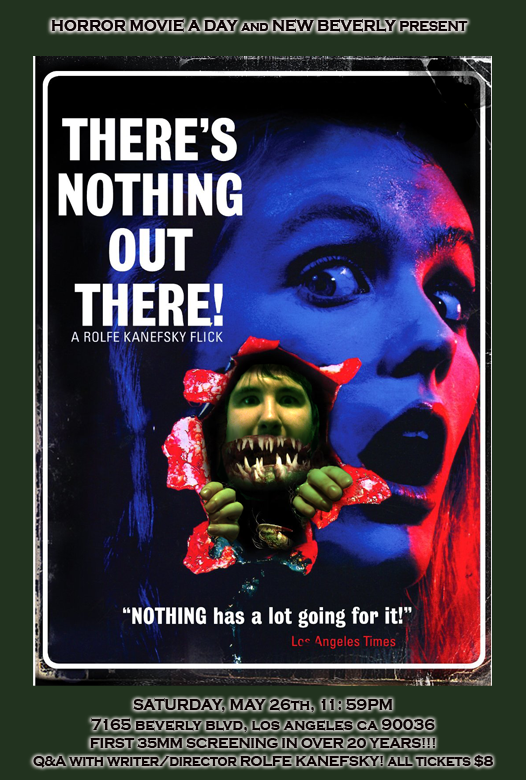 Thus, I am very excited to announce that the next HMAD screening is Rolfe Kanefsky's There's Nothing Out There!, an indie from 1992 that predates Scream. Much like that film, There's Nothing Out There follows a pretty typical horror plot (in this case, a "Cabin in the woods" scenario), but with a key difference - there's a guy who has seen every horror movie under the sun and, like Randy, uses that knowledge to help him and his friends survive. More of a flat out comedy than Scream (some gags border on ZAZ/Spaceballs-ian spoof humor), it is definitely worth a look for anyone who thought Kevin Williamson was the first one to have the idea to have this sort of approach to a scary movie. But fear not, it delivers on the horror as well - the monster is pretty awesome, and there's some great (and practical!) FX to enjoy. Plus: shaving creme. You'll see. And to top it off, it's the first 35mm screening the movie has had in over 20 years, and the reason why is pretty fascinating, especially for Los Angeles residents. So get your butts down there for a Q&A with writer/director Rolfe Kanefsky (and others TBA) so he can tell you why no one's seen this movie on glorious 35mm in two decades! The screening is Saturday, May 26th at 11:59 pm, and as always the Q&A will be BEFORE the movie, so get there on time! The New Beverly is located at 7165 Beverly Blvd, two blocks west of La Brea, in Los Angeles (90036). Street parking is widely available, and tickets are 8 bucks cash at the door or online at Brownpapertickets. I believe Rolfe will have lots of DVDs and stuff for sale and for the raffle, so it's gonna be a pretty fun night! See you there! P.S. As always, feel free to steal the image below and post/tweet/Facebook about the screening! I'm always bummed that I can't make these things, but this one especially stings. This is exactly the type of movie to see with a crowd. Kudos to you and the New Bev for screening it. Thanks for the writeup, by the way!! No problem! Doing all that I can to help the New Bev because I do intend to make it there some day. Keep fighting the good fight. Your posters get better and better. and wake me up screaming at night more and more often. jerk.